This is s little investment to make that will pay off over time with convenience and effectiveness – I can tell you that. It costs about $85-90, but is worth everyone of it. It grinds your 30 lbs of meat in no time and is good to make your own ground beef for hamburgers or meatloaf. I LOVE THIS THING! 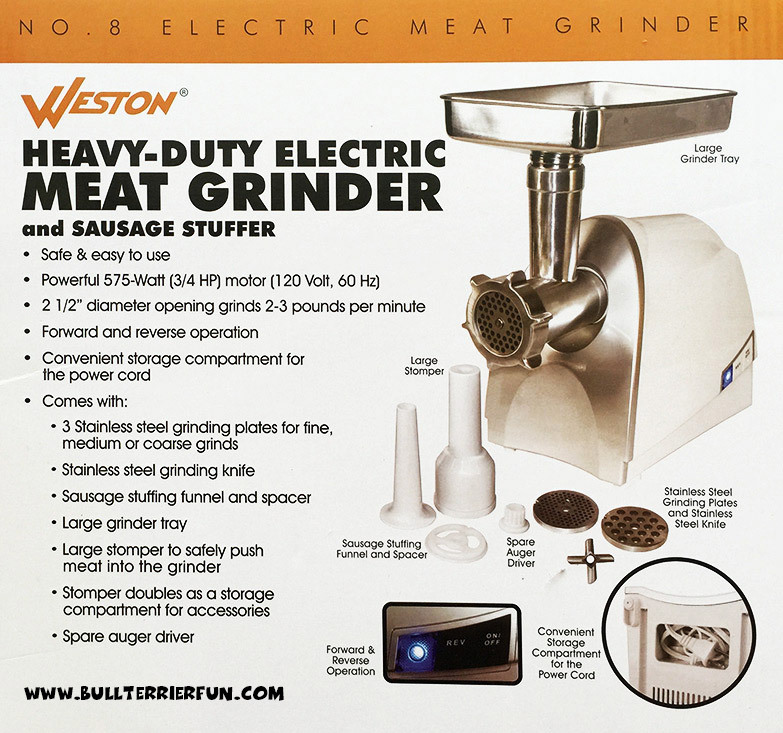 Here is a snapshot of the Weston No.8 575 Watt heavy duty meat grinder packaging displaying all of its features and included accessory. I hope my recipe helps you to make your perfect dog food. If you have any questions or suggestions, feel free to let me know. This is a work in progress and I hope I will come up with some more ideas in the future. Enjoy making your own raw food for your dog! Side note: As many efforts as I put into my recipes and as thorough my research may be, that still does not make me a nutrition expert. And I do not claim to be one. All of my advice is, of course just that – my personal advice – I do not give guarantees for anything. In cases of doubt, please, always do your own research or double check with your vet!